Small scale Antique Reproduction Chandeliers bring elegance to many interior design applications. Use a single small chandelier suspended next to a sofa in place of a table lamp. A Series of small chandeliers can be used over a bar or kitchen island for a more traditional or historic interior. Antique Reproduction Chandeliers draw from historic sources. They work with a variety of formal or traditional interiors. Look for iron, gold or silver finish in patinaed metal or painted finish. Antique Style Large Scale Chandeliers are available up to 72 inches in width. Inspired by historic chandeliers, these chandeliers are also suitable for hospitality applications. Small Crystal Chandeliers in Antique Reproduction style combine historic elements in a small chandelier. Hang a small crystal chandelier over your tub for a sumptuous feminine bath. A small dinette takes on added importance with a beautiful antique style chandellette dressed in crystal. Antique Reproduction Crystal Chandeliers feature crystal bands, pendalogues and drops in clear, amber or colored jewel-like crystal. Displayed against softened metal finishes, these look like family heirlooms. Ideal for Hospitality and Commercial application, these Large Antique Reproduction Crystal Chandeliers feature iron, gold or silver finish in patinaed metal or painted finish draped in crystal. These very large crystal chandeliers make a real statement for hospitality, commercial and large scale residential application. These chandeliers are oval in shape. They are ideal for over an island or a long dining room table. Antique Reproduction Island Chandeliers feature distressed softened metal finishes in iron, gold or silver finish in patinaed metal or painted finish. 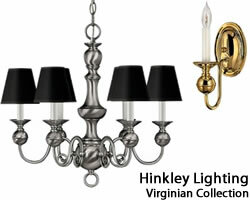 Elegant and glamorous or Arts & Crafts, these chandeliers work with an Art Deco Style interior. Curving and organic, these delicate chandeliers incorporate twisting plants and sinuous lines. Italian Tole Chandeliers, Venetian and Art Nouveau glass and lighting that could be found at a Paris Flea Market. Contemporary Chandeliers work in a variety of settings. Usually featuring a painted of matte metal finish and a diffused bulb. Brushed finishes with sleek design lines are characteristic of this style. These Contemporary Chandeliers are dressed in Crystal for a timeless look. Brushed finishes with sleek design lines are characteristic of this style. 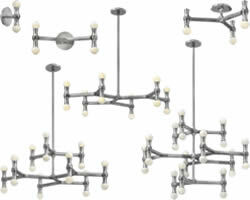 Use these small contemporary chandeliers and chandellettes in a variety of applications. Large Contemporary Chandeliers for over a large dining room, restaurant or to balance a large space. Brushed finishes with sleek design lines are characteristic of this style. Contemporary Island Chandeliers are oval in shape. They are ideal for over an island or a long dining room table. Coastal Style chandeliers bring the feel of the beach to any home. Shells and coral work with traditional to beach cottage style homes. Chandeliers draped with shells or semi-precious stones instead of crystal. Unusual chandeliers that don't follow the rules. Drawing from a variety of sources, these chandeliers can be a work of art and the focal point to a room. Large Eclectic Chandeliers for a high ceiling, a large room or to balance a large table. These unusual chandeliers stand out. These unusual crystal chandeliers are a work of art. Modern Chandeliers feature unpainted metal finish with high shine and high style. Mid-Century modern chandeliers reflect styles that developed from the late '30s to mid '60s. An American style that reflects Scandinavian design and the International and Bauhaus movements going on in Europe. Enjoying a resurgence now. These smaller scale modern chandeliers coordinate with a variety of interiors. Cool and understated. Metal and glass. Industrial components in a domestic setting. Stream-lined, clean. Functional, without ornament or decoration. Simplicity. Modern Chandeliers feature a new twist on the traditional chandelier. These large scale chandeliers are large enough for todays higher ceilings, larger rooms and dining tables. Oriental Chandeliers draw on Chinese, Japananese or other Eastern motifs. These can work well with an eclectic or contemporary interior. Rustic motifs and finishes add a cabin feeling to your home. Small, fun whimsical rustic chandeliers for your dinette or other application. Large Rustic Chandeliers bring a rustic style to a large interior. These smaller traditional chandeliers are true classics. If you fill your home with antiques, these are a good choice. 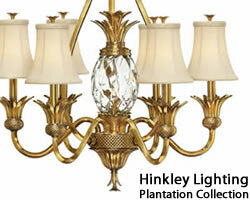 Similar to antique reproduction style chandeliers, this collection is less ornate. They coordinate beautifully with traditional homes. Traditional chandeliers in Polished Brass, or other metal finishes. Perfect for a Traditional, Colonial or American style interior. These Large Traditional chandeliers in Polished Brass or other metal finish are perfect for a traditional, Colonial or American interior. Traditional Crystal Chandeliers are sumptuously draped in crystal drops. Jet crystal makes an incredible statement. Available in Modern, Contemporary, Eclectic or Traditional style frames. Venetian chandeliers feature intricate arabeques of leaves and flowers stylized in colored glass. Contemporary models have a simpler design in beautiful hand-crafted Murano glass. Glass chandeliers come in various colors and give an airy feel to a room. Transitional style combines the contemporary and traditional. Transitional chandeliers work in a variety of settings. Transitional Crystal Chandeliers are less formal crystal. A beautiful to fit crystal into your casual interior. Small Transitional Chandeliers are an ideal choice for a kitchen dinette or an open Floor plan. Easily mixing with many styles, a small transitional chandelier adds light and style to your design. Transitional Chandeliers combine the best elements of Contemporary and Traditional. An comfortable casual style that fits in with any decor. These chandeliers may be easily adjusted up and down using a counter-weight. Pull the light down for more light, push it closer to the ceiling when you move the Table. Natural Alabaster Chandeliers are available in a variety of styles. These beautiful chandeliers stand the test of time and never go out of style. These chandeliers are not part of larger collections. They may be coordinated with many other collections by using the same finish or acrylic colors. Van Teal chandeliers, pendants, sconces, table and floor lamps can be customized to perfectly harmonize with your home. Van Teal offers a wide variety of creative contemporary and eclectic chandeliers, pendants, sconces, table and floor lamps here, in the United States. Choose from a wide range of ceiling medallions. They are organized by size from 7" all the way to 70" very large ceiling medallions. We also offer Natural Wood Ceiling Medallions in Alder, Cherry, Maple or Red Oak, Ceiling Rings and Rims, Crown Moulding, Cove Lighting, Ceiling Domes and other architectural millwork. Ceiling Medallion installation instructions are included. Ceiling Medallions: 7" to 12" l 12" to 15" l 15" to 17" l 17" to 19" l 19" to 21" l 21" to 24" l 24" to 26" l 26" to 30" l 30" to 35" l 35" to 70"